The Giddens crew first appear in May on an operation on the night of May 2nd. By chance the 2nd. Pilot was Sgt. Clayton MacCallum. on this sortie the Wellington they were flying was attacked by an Me109. No details on the attack or damage reports can be fought although there is a notation that the enemy fighter was destroyed north of Laval. It is unclear if the gunners in F/S Gliddens crew were responsible or not for the destruction of the fighter. Problems with e Wellingtons oil reserve system left Giddens no choice but to jettison his load and return to base early. It is noted in the squadron records that the crew had a good hand at helping destroy the Aerodrome at Stuttgart. The perimeter track and flare path were all lit up and an aircraft with navigation lights on was landing just as P/O Porter released the bomb load. On what appears to be only their third operation the crew flying in Wellington X3480 squadron ID VR-J took off from Mildenhall at 2215 on a bombing operation to Warnemude a Baltic port town. This would be MacCallum's fourth sortie as 2nd. Pilot, during this early stage many of the new pilots went on three or more 2nd. Pilot sorties. The aircraft was hit by flak badly damaging the Wellington and causing the death of P/O Porter. X3480 came down off Rejsby which is 10km SSW of Ribe Denmark. The crew members set fire to the remains of the aircraft after removal of the body of P/O Porter. All the remaining four crew members and MacCallum became Prisoners of War. This is the story from official RCAF/RAF sources. 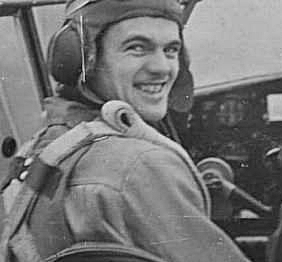 One other source mentions that the aircraft was attacked by night fighters, and in this attack P/O Porter was killed and 2nd Pilot W/O MacCallum was wounded three times and F/S MacMillan shot in both legs. And at this point I can not find any mention of wounding of the two of the crew in any other source, nor is there any mention of hospitalization of any of this crew. This second account appeared to come from local sources, who would have passed it on to RAF investigators after the liberation of that area.